A smart business strives to appeal to as many customers as possible and customers with disabilities love to shop and spend money as much as the next guy. There are over 48.9 million living with a disability in the U.S. Taking notice and appreciating our buying-power can be one of the best business moves you’ve made all year. Our population just in the U.S. spends $150 billion annually. And while there are a lot of things you can do to serve us better, more than what we can list here, there are a solid handful of ways to really improve your facility and overall business-attitude. From expensive upgrades to just a simple shift in attitude, here are our 12 disability-friendly tips for every busniess. 1) Install tactile buttons at the checkout. For customers with limited vision, tactile buttons too are essential to have. These go in the checkout area (and in at least in one lane) and allow people who are blind to enter their pin independently. These buttons aren’t too expensive and truly give people with vision disabilities complete independence when they go shopping. 2) Make aisles wide enough and clutter-free. I don’t care if new stock was just delivered and it’s Christmas, or maybe your store is tiny and you’re taking up as much square footage as you can, but putting too many items out on the floor, narrowing walk-paths and aisles as a result, s a big no-no when creating an accessible environment. I do not want to roll things over just to shop, but I will if I must. A 32 inch wide path/aisle is the minimum you should have in your store. 3) It’s ok to offer help. It can sometimes feel like a catch-22 when a person with a disability comes into the store – do you ask right away if they need help? Or would that be considered rude? Does etiquette dictate you wait until we ask you? If it’s a store environment, it’s totally ok for employees to approach us and ask if we need help. I love having real help right there, instead of having to hunt down for it. 4) Teach employees to treat us with respect. This may be something you already do, but making sure your employees are on the same page when it comes to the right way to treat us is key. Many, many people have had no direct experience with someone with a disability before and this could be one of your employees. Stress the importance of treating all customers with the same amount of respect and courtesy as they would to any other customer, and you’re on your way to having awesome employees. 5) We love to spend locally. Many people with disabilities tend to be very devoted to hometown businesses, especially if they’ve helped support local group. And since many of us don’t drive and roll to where we need to go, that makes us devoted to hometown businesses near us even more. 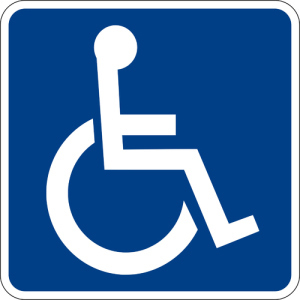 If you are a hometown business, making a note on your site or Facebook welcoming “Customers with disabilities – contact us if you need any special assistance” is a great first step. 6) Speak directly to us and make eye contact. If a customer with a disability has a significant other with them or someone else, such as a caregiver, make sure you and your employees do not speak to the able-bodied person who’s with them just because it’s easier comfort-wise. Making direct eye contact is important with customers with disabilities as well. Simply put – don’t ignore patrons with disabilities. 7) Ask permission before petting service dogs. Many times people with disabilities have a service dog and they can range from labradors to tiny little cute things nowadays, but no matter how adorable, make sure your entire staff knows rule number one when it comes to interacting with service dogs – do not pet them. When they’re out in public, they are “on the clock” so-to-speak and should not be disturbed. 8) Install an automatic door button. It may be a rather expensive upgrade, but if you can afford installing an automatic push button on the entry door to your store, please consider it. You have no idea how hard it can be to open some doors from a wheelchair, especially if it’s windy. I’ve actually left and not given my business to many places simply because the door was too hard to open. 9) Offer specialized help if needed. If you’re a restaurant owner, special requests can sometimes occur from certain patrons with disabilities, such a meat-cutting requests before bringing out the entree to a customer requesting multiple straws. No matter how minor the request, make sure your employees are aware that such requests may come in and if they do, to fulfill them as politely as possible. 10) For customers using communication devices, wait for instruction. While people who are deaf have been using just a pencil and paper as their main communication “device” for years (this is good to keep on hand at the register too), there are a lot more techie communication devices these days for all types of disabilities. One of the most memorable – a talking speaker box. Whatever kind of communication device a customer may use, the number one thing to remember is to be patient and wait for our instruction for assistance. We may take a bit longer to get our words out, but we can get it done (otherwise we wouldn’t be out shopping on our own). 11) Give is extra time at checkout. Remember to be patient with us. This is also a big deal at the bank and drive-thru. Many times a customer with a disability is slower, making sure your employees are patient with us is a big thing. There may be a huge line, but that should never matter. And also, providing a lower counter area where we can sign the receipt, etc, is something to install that’s very much appreciated by those who use wheelchairs. Even if you can only install a little flip-out writing spot, anything lower will make us love you. 12) Don’t pre-judge our abilities. And perhaps one of the most significant things to teach employees – never pre-judge our abilities. Not every disability is visible, nor is a disability as severe as it can sometimes seem. Bagging our groceries without asking first for example is a big-no-no. Simply make a point to always ask first in all areas before automatically helping and you’ll be good to go. If you don’t know someone with a disability personally, it can be a bit nerve-wracking trying to get catering to customers with disabilities thing down pat. But it’s 2013. Making sure you do this as a business-owner will make your entire customer-base happy and that can a great thing for your bottom line. And don’t forget, if you treat us well, you will have a repeat customer for life.